We finally start to pull away from the months of fishing indecision. It is finally time to get serious with the grouper on the patch reefs as they get into their winter mode with just these few remaining months before the door is summarily slammed shut just as the fishing starts to heat up. The wreck fishing on the deeper Atlantic spots are also going to start to sizzle. Until the sailfish start to show in numbers after the first cold fronts, it is a bottom fisherman’s dream. Whether you are fishing shallow on the patches or deep on the wrecks it is the bottom anglers that will be bringing home the proverbial bacon. The patches will be a mixed bag anglers dream. 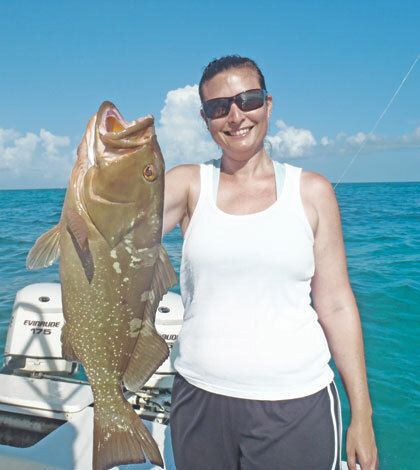 There are mixed grouper, snapper and mackerel catches to keep even the antsy-est angler occupied. As long as there is a little current to spread your chum you can call in fish from hundreds of yards down the reef line. When all goes according to plan, the ballyhoo will show up in numbers behind your boat and they are the key to firing up the bite. We usually start the day with live pinfish but will soon switch to live and fresh cut ballyhoo as soon as we can get some close enough to get a net over them. If you are lucky enough to have some patient anglers on board or perhaps some young un’s that want to keep busy you can always give them an ultra-light rod and put them to work catching ballyhoo with hair hooks one at a time until the school comes within cast net range. 4It is almost a guarantee that if you have ballyhoo behind the boat, the gamefish will follow. A trace of wire leader bridled to a free swimming ballyhoo is sure to draw vicious surface strikes from cero mackerel. 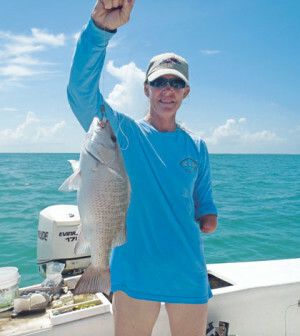 Don’t be surprised if a grouper or large snapper come off of the bottom for this most tempting of all baits. 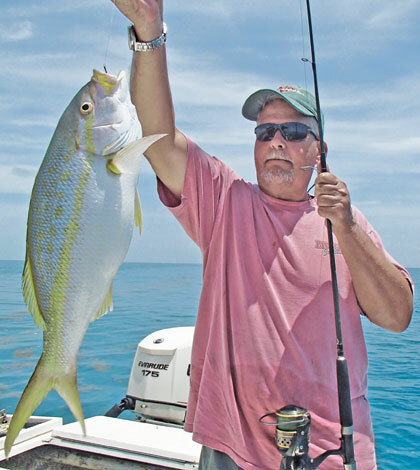 A large plug of ballyhoo on the bottom will attract just about anything that you could ask for in the way of reef dwellers with the possible exception of hogfish that will turn their nose up at anything but a tasty crustacean. For fishing the bottom, a knocker rig with a small egg sinker will do the trick. I prefer a little heavier line. Anything less than thirty pound test and you will lose more keeper grouper than you will land. The Mustad 9174 bronze short shank live bait hook in 4/0 is plenty to hold even the largest grouper or mutton snapper. If the hook is too large for any passing fish you probably didn’t want to clean anything that small anyway. The deep wreck activity should also give a great mixed bag of tasty critters. The amberjack, almaco and muttons should all be ready to cooperate. Whether you prefer dropping pinfish to the bottom or working a vertical jig through the entire water column you should be able to keep the rods doubled over and your back aching. Toward the middle of the day the blackfin tuna should start finding their way to the depths around the wrecks. They can be chummed up with a generous supply of live pilchards used as live chum or you can simply deploy the vertical jigs to accomplish the goal. To rig for dropping a live pinfish you should start with fifty pound Spectra and splice about ten to twelve feet of sixty pound fluorocarbon. Slide a four to six ounce egg sinker depending on the depth and speed of your drift through the water. From there you tie a barrel swivel and then another dozen or so feet of the sixty pound fluorocarbon. End this with a circle hook and you have the ideal bottom for plumbing the depths. 1Rigging the vertical jig is even simpler. You still start with about fifty pound Spectra braid and tie on about a dozen feet of sixty pound fluorocarbon. Make sure to tie the vertical jig to the top eye on the same eye as the hook is fastened. A lot of anglers new to the sport of jigging are tempted to tie the line to the opposite end of the jig however it just doesn’t work nearly as well that way. While technically there is no wrong way to work your jig, I have had best luck letting the jig fall to the bottom and then jigging in a pattern similar to …set the hook… reel down fast, the same speed as you lower the rod then repeat all the way to the surface. While drifting the wrecks you should keep a live bait on the surface as you never know what might come by. You should not be surprised if a late dolphin or an early sailfish give your surface swimmer a look.